Views under the Palm | johnmpoole.com: Hurricane Sandy: stay informed, stay safe, don't panic! 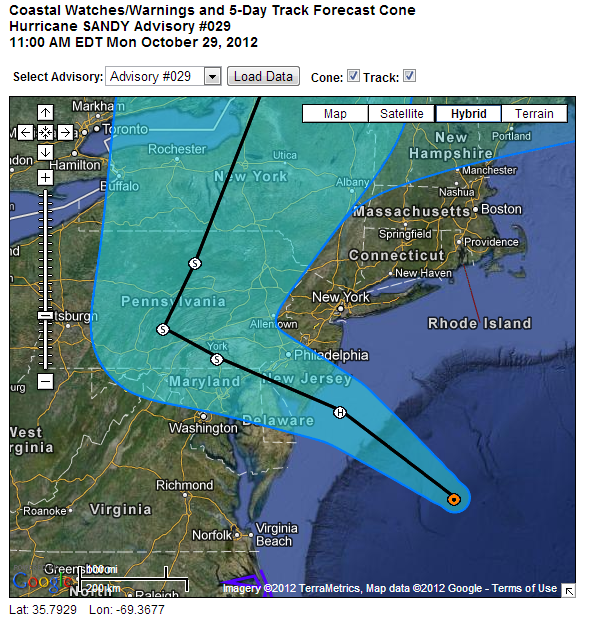 Hurricane Sandy: stay informed, stay safe, don't panic! Re: Hurricane Sandy - It's disconcerting to see people needlessly panic. Oh, I understand the purpose of the media hype (ratings), and politicians posturing ("PR" and getting in line for federal $$$), and of course the "panic buying" has been great for Home Depot and Walmart, but honestly, having lived in Florida and gone through 4 hurricanes in 1 year alone (2004), a little reality check is appropriate. Hurricane Sandy is only a Category 1 hurricane--maximum sustained winds of only 90 mph as of 2 pm EDT. You can expect precipitation (rain/snow), wind, some flooding, and some coastal storm surge, depending on your actual physical location. Loss of electric power will be the worst thing that will happen to most people in the path of this storm. Stay informed. Stay safe. But don't panic.